I appear along with Level Architect Alex Munn on BioShock 2's official podcast #2, available now from the Cult of Rapture, both in audio and text transcription form. Ever get that feeling? That optimistic, uplifting feeling that despite the economy, torture, and global pandemics, a few little things might be going right in the world? That's just how I felt upon completing a couple of notable independent games this past week: The Path and Zeno Clash. They made me happy that engrossing, novel, invigorating games are occupying that middle ground between retro/lo-fi and triple-A blockbuster, now more than ever. It's something I've been talking about for years, and to play such vibrant examples really makes me excited for the future. The middle ground I'm thinking of is hard to pin down, but a few common properties describe it: the games have smaller teams and budgets than your standard, triple-A retail shelf title, but use similar, modern graphical technology (full 3D, modern rendering techniques.) They're bigger productions than single-author, bedroom coder, 2D/Flash/ASCII efforts that one often thinks of as the definition of "indie" but explore similarly outre themes and aesthetics compared to most mainstream fare. They use many of the same design, structural and representational elements as big, triple-A games, such as immersive first-person or third-person direct control over an avatar, a fully navigable 3D gameworld, voiceover and scripted sequences, but are generally shorter in length and lower in rendering fidelity. Basically, they are like a triple-A production that has been strategically and drastically reduced in scope, allowing them to focus on specific, and less conventional, mechanics and aesthetics, and smaller target audiences than their mass-market counterparts. They benefit greatly from the reduced overhead and plugged-in audience that digital distribution channels like Steam and Direct2Drive provide. Putting one's finger on just what to call these sorts of games can be tricky. I've used "game noir" in the past, but that has too specific an aesthetic connotation. I've tried "B-games," like B-movies, but that has negative implications of quality, even if the most vital films of the mid-century were often B-movies. So I'll try this: Single-A games. They're like triple-A games, but trimmed down and tightened to fit a smaller team, smaller scope, and usually a smaller audience-- to try new, interesting, and exciting approaches that the baggage of a triple-A production can almost never allow. Single-A games: they're what we need more of, and The Path and Zeno Clash are two outstanding examples. Created by Michael Samyn and Auriea Harvey, The Path takes the Little Red Riding Hood fairytale as its jumping-off point. The player chooses one of six girls, each named with a different synonym for "red" (Ruby, Scarlet, Ginger, etc., except for Carmen, whom I'm guessing might be a reference to the opera heroine? A commenter below suggests a play on "Carmine.") The player's stated goal when choosing a girl is to lead her to Grandmother's House, and to "stay on the path." This is simple--the path leads straight ahead to Grandmother's House, and the player need only hold the 'walk forward' button to succeed. 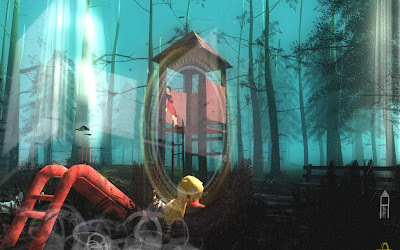 However, upon ignoring the game's directive and leaving the path, the player is immediately lost in a deep forest, where a variety of strange objects and characters are waiting to be found. Each girl has a different reaction to these points of interest, which bit by bit builds up the individual character of your chosen charge. Two other characters can be found wandering through the woods-- the girl in white, an ethereal figure who plays without a care and tends to lead the player to interesting things, and the Wolf, who takes a different form in each chapter. Upon leaving the path, there is no way to return to it-- the only way to escape the woods is to find the girl's Wolf. A sort of compass leads the player to the Wolf's location, but figuring out how to draw the Wolf out can take the form of a point-and-click style puzzle. 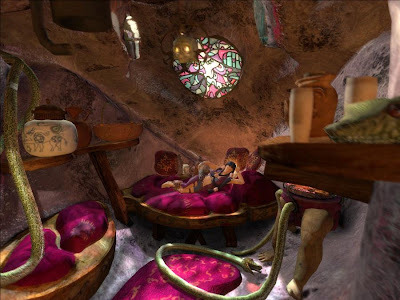 Upon either walking down the path or finding the girl's Wolf, the player enters Grandmother's House, which takes the form of a garish, off-putting virtual installation art piece. The most interesting thing about The Path is experiencing each chapter through the lenses of the different girls' personalities, piecing together their mindsets through the snippets of reactions they have to the world, and discovering the forms that their different Wolves take. 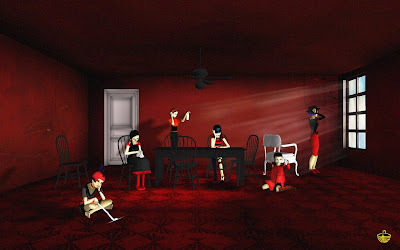 Grandmother's House is twisted a different way for each girl, presenting a very subjective environment informed by their individual traits, and the experience you had in your own playthrough with that girl. The art is at times both lovely and disquieting, and always quite accomplished-- the world and the characters, and especially the Grandmother's House installations are wonderfully realized. And though less overt, the systems are interesting in their somewhat combative dialogue with the player. It's a game that wants you to play it in a particular way-- slowly, contemplatively, and aimlessly. You can feel the designers witholding information and control from the player to this end: if the player chooses to run instead of walk, after a few moments the camera lifts up as if on a crane to look straight down at the girl, and the screen darkens with gloom to the point that seeing where you're going is impossible; spending most of your time walking is the only feasible approach. A sort of map exists which plots your trail through the woods, but only appears each 100 meters that you run, and only fades in for a moment-- it allows you to periodically readjust your heading, but denies the player the ability to check their map constantly, encouraging the feeling of being lost. 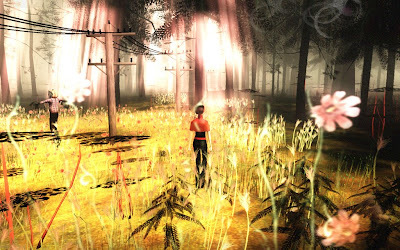 Compass indicators pointing to the Wolf and the girl in white are ever-present on the screen, but update so slowly that the player is required to stop and wait for them to "catch up" if they want to use the compass at all. It can be frustratingly transparent, and in some cases makes the systems completely unreadable (I didn't know until I looked on the game's Steam forum that the compass indicators were anything but artsy embellishment-- they update SO slowly that without a tutorial, I didn't realize they meant anything at all.) But the core systems of movement, interaction and camera control are so transparent and solidly implemented that such examples only make the hand, and the intent, of the authors that much more noteworthy an aspect of the experience-- these are systems with purpose, based on a calculated thought process, which is more than can be said for many games. The Path is the sort of unique, personal, and affecting experience that subsequent single-A games might aspire to match. It's only $9.99 on Steam, Direct2Drive, or direct from Tale of Tales. Games boast the potential to transport the player to worlds completely removed from our own. And yet we so often fall back on tired or blase settings that when a truly unique, unprecedented gameworld appears, it's a real rarity to be celebrated. Enter Zeno Clash, the creation of the brothers Bordeu-- Andres, Carlos, and Edmundo. The land of Zenozoik is a completely novel invention, a gameworld unlike any you've seen before. It's not just crazy and new, but strikingly beautiful to behold. Coming off of a string of intriguing mod creations, some overambitious for the size of their team, ACE Team decided to focus on "one or two innovative mechanics," resulting in Zeno Clash, a very linear, constrained game all about close-range arena battles decided by melee combat and primitive firearms such as muskets and slingshots. 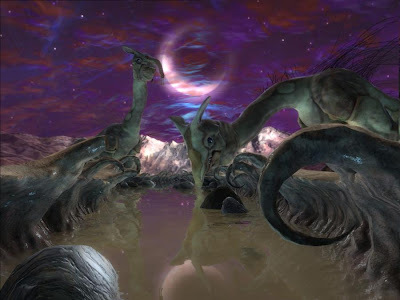 The game's protagonist is Ghat, a man who, as the game begins, has killed Father-Mother, a towering bird-like figure who's raised hundreds of children that populate the land. The game alternates between depicting the events leading up to the assassination of Father-Mother in the past, and Ghat's long, arduous journey through Zenonzoik as he flees Father-Mother's territory, pursued by her assassins. The wonderful thing about Zeno Clash is how every presentational and gameplay element compliments every other-- the world itself is fairly medieval in its level of technology, which lends itself to the raw, small-scale fisticuffs of the core gameplay. The story of the protagonist's flight provides the rationale for a rapid tour through all different parts of this amazing, alien world, allowing the developers to show off environment after stunning environment, showcasing the sheer breadth of the creators' imagination. The first-person perspective gives the player the viewpoint of an actual inhabitant of this place, surrounding them with every strange detail, making this imaginary place all the more real. Consider Zeno Clash from an elevated third-person perspective: the gameworld and characters, having so little relation to our own, become that much more artificial, like scale models. Approaching this fantastical architecture and the unbelievable inhabitants of this world at eye level is what makes it all feel so real. Mechanically the game is a joy (though my one major complaint would be that the game defaults to Hard difficulty, and even Normal, the lowest setting, exhibits some serious difficulty spikes. How about an Easy mode, guys?) Every impact of fist and swing of bludgeon feeling weighty and solid. 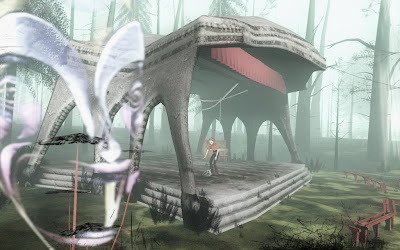 The player's attacks really seem to make contact with their targets, creating a strong illusion of physical connection between the player and the occupants of this place, as opposed to the disconnected floating viewpoint of some other first-person games. 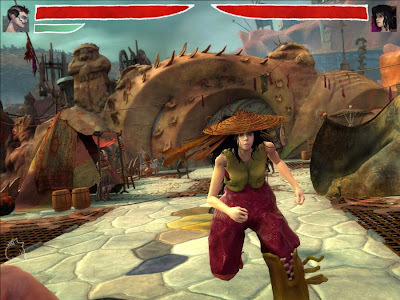 The combat system is deep enough, allowing the player to dodge, parry and counterattack strategically. Selecting a particular weapon is a meaningful choice, as each has its own specific advantages and disadvantages. But much like a standard FPS, the core mechanics of Zeno Clash are fairly constant throughout; what makes the gameplay really interesting is great, creative level design that changes up your situation continually over the course of the game. One level might be a fairly standard arena battle in a city square, while the next challenges the player to fend off hostile creatures on a wooded path; the next might send you hunting for scurrying game in the underbrush, or defending a boat as it's rowed down a stream, or keeping a torch lit in a pitch black netherworld to keep shadow creatures at bay. The variety in gameplay challenges handily matches the ever-changing scenery and twisting, surreal storyline. The novel gameplay paradigm and highly unorthodox setting, likely too risky for a triple-A production, perfectly suit the single-A scale and direct download platform chosen for Zeno Clash. In fact, it's the sort of game that most likely never could have existed without the viability of this middleground. I hope that ACE Team is successful with Zeno Clash (and perhaps they are-- apparently the game was Direct2Drive's #1 download this week) and that other small, innovative development teams will be encouraged to stage their own wild experiments following this model. Zeno Clash is available on Steam and Direct2Drive for $19.99. Alright, so I think these games are great, and you should play them. So what? The point is that they demonstrate the amazing potential in the single-A space for individuality, experimentation, and immediacy. They sidestep many problems that normally plague boxed triple-A products-- problems like unfocused design, "safe" (boring, juvenile) settings and mechanics, overlong campaigns that nobody finishes, and inflated price tags-- delivering fresh, unique, and easily-digestible experiences that can reasonably be dived into, enjoyed, and completed over the course of a half-dozen hours or so, all for less than the price of a used copy of that big-budget blockbuster that came out a couple months ago. If the single-A space could expand from the current slow trickle of releases to dozens of titles released every year-- or every month!-- then single-A games might act as that bridge between bedroom indies and corporate blockbusters, giving emerging talents a place to shine, and all of us more, different, inspiring experiences to enjoy. Is this a natural progression as more funding for independent teams becomes available and the barrier to acquiring the means of producing immersive 3D worlds is lowered? 15 years ago, pixel art side-scrollers were our triple-A blockbusters; now the one-man productions using this model are innumerable. Hopefully games like Zeno Clash and The Path (and Gravity Bone, and Flower, and so on,) are early glimmers of the successful intersection of immersive 3D and the indie mindset. And hopefully they're to be followed many, many more.